I really enjoyed this cookbook especially since we are trying to eat healthier. 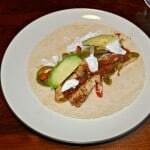 Eating clean is not so much about counting calories and fat as it is eat healthy, whole foods. Many of the recipes in this cookbook are filled with fruits and vegetables. Most of the recipes used ingredients I buy at the market every week anyhow so it’s easy for me to pick up this book after my grocery shopping and find something to make. Eating clean doesn’t mean spending hours cooking. 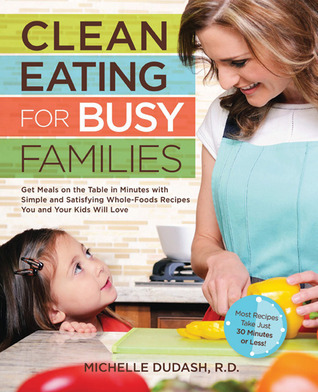 In fact, most of the recipes in the Clean Eating for Busy Families Cookbook are ready in 30 minutes or less. There are appetizers, salads, seafood, meatless dishes, poultry, meat, and even skinny treats in this fabulous book. The best part of the recipes in this book is that they are filling and still good for you. If you are looking to eat clean and green but feel like you don’t have the time, this is the cookbook you should start with. 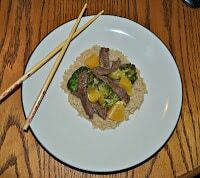 To make the stir-fry: Heat a large frying pan or wok over high heat, add 1 cup (235 ml) of water, and bring to a boil. Add broccoli, reduce heat to a low boil, and cover with a lid or piece of foil, leaving a gap for steam to escape. Steam for 5 minutes until almost fork-tender. Move broccoli to a plate, reserving cooking water in another container. In a medium bowl, sprinkle garlic, ginger, and salt evenly over the beef. Scrape the pan clean, place it on high heat, and add the oil. When oil is shimmering, add the beef in an even layer and cook for 2 minutes undisturbed until brown. 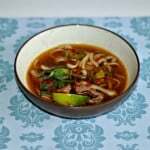 Toss with a wooden spoon to break up the pieces, reducing heat to medium-high as needed. Add orange zest and sesame seeds and cook until beef is done, another 2 minutes. 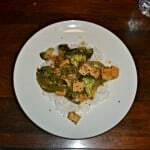 Swirl in the sauce, add broccoli, and stir-fry to reheat. Add a splash of reserved broccoli water if mixture seems too dry. Serve hot and garnish with orange segments. Replace Japanese soy sauce with a domestic soy sauce, which is still authentically manufactured but doesn’t require a gas-guzzling trip overseas. « Lowfat Blueberry Lemon Chip Muffins: What’s Baking? 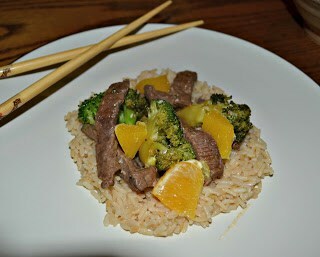 Orange Beef is my favorite take out Chinese, but I rarely eat it for obvious reasons. I am pinning this–thanks for sharing! Wow. That looks fantastic! 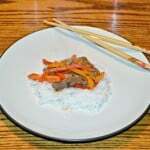 I would like to taste that beef stir fry with orange, because based on the picture here it looks very delicious.